The first presentation on the Family and Education Day was made by Professor Batu Erman from the Faculty of Engineering and Natural Sciences. Batu Erman's lecture on "Drug Design and Production in Nanolabs" was followed by Faculty of Engineering and Natural Sciences member Ali Koşar on “SU Pistol and Cancer Treatment". 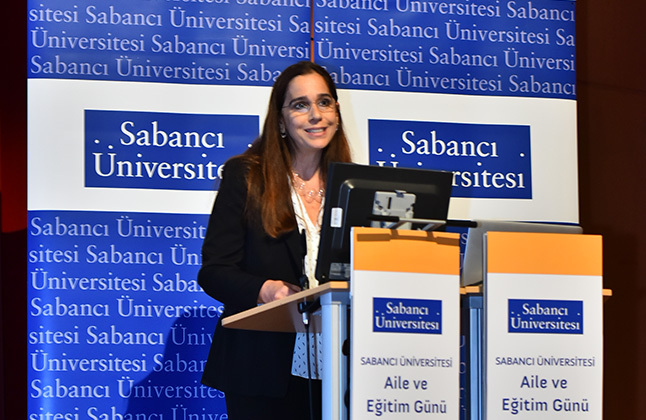 Faculty of Arts and Social Sciences member Assistant Professor Çağla Aydın spoke on “Language, Memory and Psychology”, and the last speaker of the day was School of Management Acting Dean Professor Füsun Ülenginon “The Impact of Transport Restrictions in Europe on Turkish Economy”.